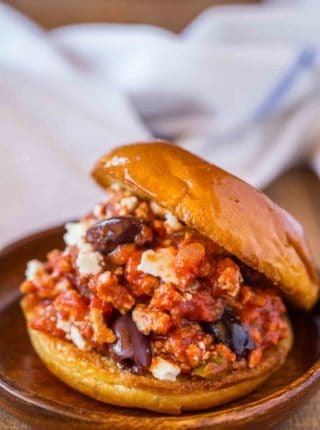 Greek Sloppy Joes made with ground beef, tomato gravy, feta cheese, and kalamata olives on a toasted brioche bun will melt in your mouth and are ready in less than 30 minutes! It’s time for another addition to my Sloppy Joes series, and just in case you missed it Bacon Brown Sugar Sloppy Joes are a big hit these past few weeks, along with Sausage and Pepper Sloppy Joes! 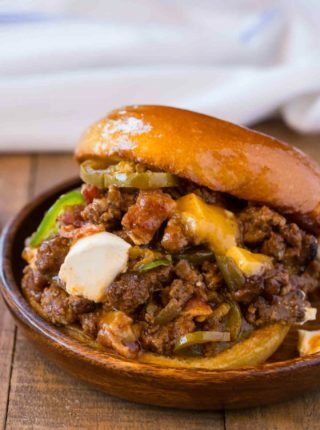 Greek Sloppy Joes are the PERFECT combo of my Ultimate Sloppy Joes with some classic Greek flavors. 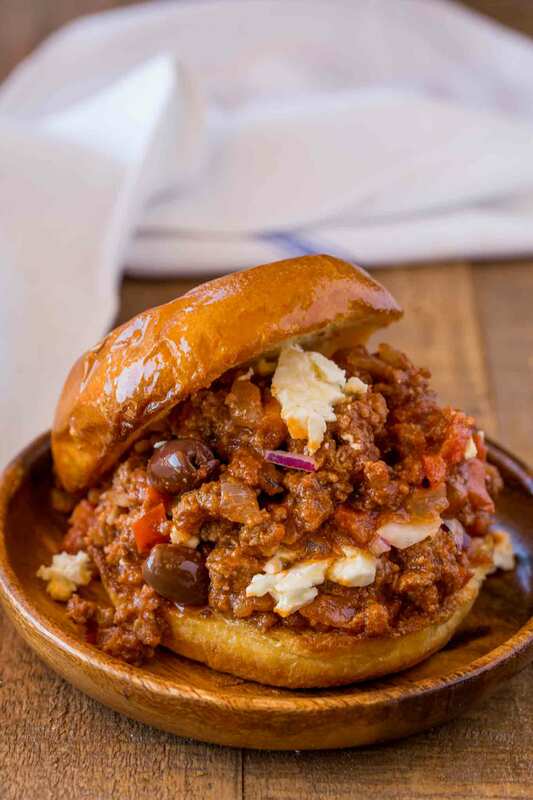 The feta cheese gives it a really nice savory bite, while the kalamata olives bring a flavor that just takes these sloppy joes to a whole new level of amazing. Greek recipes do well around here in general, and one of my family’s favorites is my One Pot Greek Chicken and Rice. It’s super easy to throw together and comes out restaurant quality good! My kids love the taste of olives, but they can handle the briny taste you get with a lot of greek dishes. If yours don’t like the kalamata olives, you can swap it out for classic pitted olives and serve the feta cheese on the side so they don’t have to add it if they don’t like the flavor. 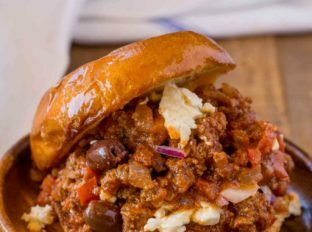 Sloppy Joes are great for meal prepping, so you can do these ahead of time if you have a busy week coming up! Cook the meat, veggies, and sauce as normal. Set some of the sauce aside in a separate container. Stop cooking the sauce a little bit before you think you should, to give it a chance to thicken when you refrigerate it. When you go to reheat the sloppy joe, add a few tablespoons of water when it’s heating up. Then add the sauce we set aside. Keep the toppings and extra ingredients separate until you’re ready to serve, like the feta and olives. 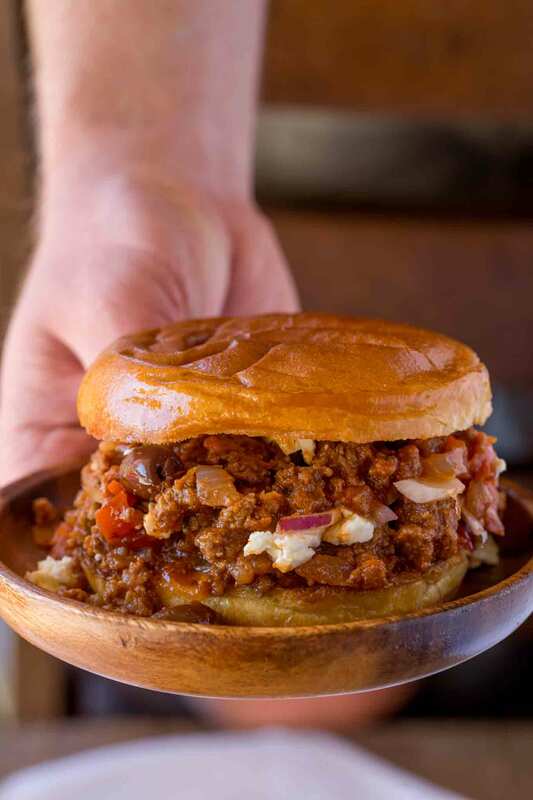 Toast your buns right before you serve the greek sloppy joes. I wouldn’t do this step ahead of time as the bread will go stale, and it tastes better when it’s hot. I serve these with this Easy Greek Salad. Another favorite is my Beer Battered Onion Rings, or Crispy Sweet Potato Fries. There’s a lot of briny olive and feta flavors going on here, so I try to keep the side a little basic. Add all of your ingredients to the slow cooker, minus the feta cheese and olives, and stir together. Once it’s ready, top with olives and feta cheese. Toast your buns and serve! Add the feta and olives at the very end, so the briny flavors don’t overpower the whole dish. 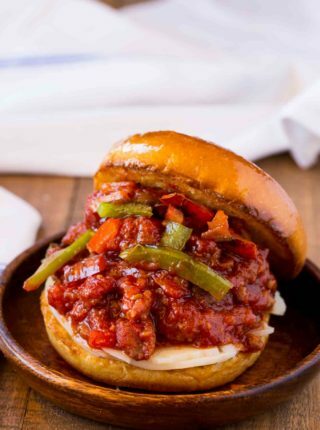 The sauce is key to a good sloppy joe. Make sure you don’t rush it, and stop cooking once the sauce looks like it’s just starting to thicken, and it will thicken more as it sits. If you cook it for too long, it’ll evaporate too much and your meat will be too dry. You can change the ground beef in this recipe for lamb. 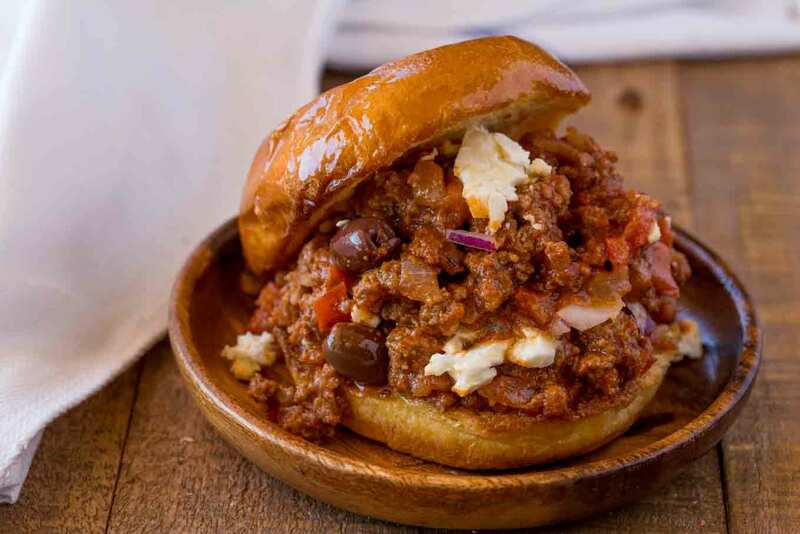 Lamb sloppy joes have even more of a Greek feel! Make sure you TOAST THE BUN! This keeps your greek sloppy joe from getting too soggy. Pro Tip… Add butter for even MORE flavor! I’d love to know how it turns out for you so if you do make the recipe pretty please come back and leave a comment letting me know how you enjoyed them. We put a whole lot of delicious effort into recipe testing ALL of these Sloppy Joes, just for this weekly series! Add the beef, olive oil, onions and green bell pepper to a large skillet on medium high heat breaking it apart. Cook until well browned (5-6 minutes), then add in the garlic, tomato sauce, beef broth, tomato paste, and oregano and continue cooking until the sauce starts to evaporate. When the sauce is reduced top with feta and olives and serve inside a toasted brioche bun. Click on times in the instructions to start a kitchen timer while cooking. Thanks for sharing this recipe! This one met all of my requirements. Quick, easy and very tasty! Thanks for coming back to let me know how much you enjoyed it, Jim! This is such a fun twist of a classic recipe. Love these flavor additions. We sure love this easy dinner recipe! Family fave! Thanks for letting me know, Lori! 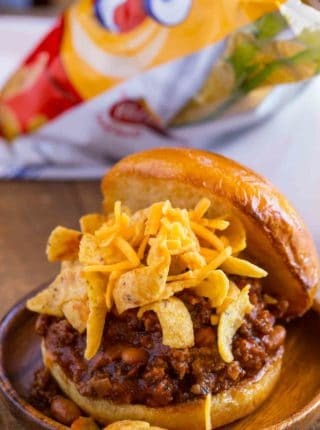 what a great way to change up the ‘ol sloppy joes!! It’s fun to change things up! mmm..these look SO delicious!! My kids would really LOVE these!! This looks like a delicious dinner for my family! Perfect for weeknights!